2009 March | Affordable letterpress stationery that is artistic, charming, elegant. The excitement is building for Pet Lovers Everywhere. Here is the front cover and a “snipit” from the back cover! 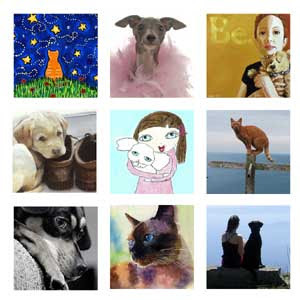 My human mom’s painting is being published in the very very special Paws For Charity project. My tail cannot stop wagging. Check it out here for more info. 1. The Avon Foundation supports breast cancer programs worldwide…in 50 countries. 2. This charity has the “Humane Charity” seal of approval. Knowing that breast cancer is the most commonly diagnosed cancer among women, the goal of the Avon Foundation Breast Cancer Crusade is to benefit all women. However, there is special emphasis on reaching medically underserved women, including low-income, elderly and minority women, and women without adequate health insurance. Reversing historical disparities in breast cancer care is a priority of the Avon Foundation Breast Cancer Crusade. Today it was winter again and I love it! Remember, I just spent last week in HOT Utah hiking my big paws off and now it is 15 degrees, with a fresh blanket of snow. I can’t begin to tell you how much fun I had today when my human mom took me and my tennis ball for our daily walk/romp in the park. We had to head back home after only 4 miles because mom has a lot to get ready for. Here is a hint of something coming up SOON for CabinPress Studio, stay tuned for the exciting news. I don’t want to let the “Cat out of the Bag” but you can check the Paws For Charity Blog for a “teaser”. Go play in the snow and happy tail waggin’ to all. Walk A Mile In My Paws. We have returned from our Utah “birthday adventure” with all our paws! The trip was mainly for me and breaking in my new fancy, colorful, and some may say “yuppie puppy” backpacks and booties for my BIG feet. Actually, it was my human mom & dads birthday trip, remember to check out the CabinPress Studio Etsy Store for some fantastic birthday celebration deals. You know I grew up in the mountains of Colorado and I am a Colorado Mountain Boy so a visit to the desert was a real tail wagger for me. I soon figured out what those backpacks were for. Humm… carry my own water, carry my own treats, carry treats for mom & dad too…. WOW, I was exhaused. I did get to see some very interesting sites and to my mom & dads happiness they really like dogs at Hovenweep National Monument and I got to hike the entire time on the park trails with them. A big WOOF goes out to the National Park Service from me. Tail wags to all and remember to leave a comment so my human mom can send you a surprise.